Background: People of all ages can suffer from Henoch-Schönlein purpura (HSP), but it is the most common vasculitis in childhood. The most important involving gene is located on chromosome 6p21.3, a region coding for human leukocyte antigens (HLAs). Among HLA genes, because of the high rate of polymorphisms, HLA-DRB1 is estimated to have a strong association with HSP. In this study, we aimed to assess the association of HLA-DRB1 alleles with HSP in Iranian children. Materials and Methods: This study consisted of thirty Iranian children with HSP and 35 healthy controls. Genomic DNA was extracted, and HLA typing was performed by polymerase chain reaction with sequence-specific primers technique. Results: The results have shown that HLA-DRB1*01 and HLA-DRB1*11 (P = 0.002, odds ratio [OR] = 7.579, confidence interval [CI] = 1.934–29.697 and P = 0.039, OR = 3.333, CI = 1.030–10.788), respectively, are the most frequent alleles associated with HSP in Iranian children population. The frequency of other alleles was not significantly different in both groups. The results also show no correlation between HLA types and disease manifestations. Conclusion: According to these results, there is an association between HLA-DRB1*01 and HLA-DRB1*11 gene polymorphisms and susceptibility to HSP in our study group. To date, there have been no reports supporting a consistent relationship between HSP and HLA-DRB1 in Iranian pediatric patients. Therefore, the current study aimed to assess the association of HLA-DRB1 alleles with HSP in Iranian children. From September 2013 to October 2014, thirty patients with HSP who attended outpatient clinic or accepted to Mofid Children Hospital were recruited for the present study. At diagnostic time, they were between 2 and 13 years old with a mean age of 6.4 years (standard deviation [SD] = 3.06). Their disease was diagnosed by a pediatric rheumatologist, based on new classification by final European League Against Rheumatism/Paediatric Rheumatology International Trials Organisation/Paediatric Rheumatology European Society criteria for HSP and classifi�cation defi�nition, which indicate that at least one of the following four criteria should be present: diffuse abdominal pain, any biopsy showing predominant IgA deposition, arthritis or arthralgia, and renal involvement (any hematuria ± proteinuria) in the presence of palpable purpura which was a mandatory criterion [Table 1]. For control group, 35 genetically unrelated healthy adult individuals who had no history of autoimmune disease voluntarily participated in the study. The study had ethical approval from the local Ethics Committee of Faculty of Life Sciences and Biotechnology, Shahid Beheshti University, and oral or written informed consent was obtained from all participants or their caretakers. DNA isolation was performed by chloroform procedure  from leukocytes of peripheral blood collected (2 ml) with ethylenediaminetetraacetic acid and kept at −20°C. The concentration and purity of DNA were measured by NanoDrop (Thermo Scientific, USA). We used HLA-DRB1 typing by polymerase chain reaction with sequence-specific primer (PCR-SSP). A total of nine sequence-specific oligonucleotide primers were used to identify seven types of HLA-DRB1, and for positive control, two β-actin primers were used in every reaction. In amplification by PCR, total volume of 20 μl master mix was used for each 0.2 ml PCR tubes which involved: 2 μl PCR buffer 10X (500 mM KCl, 100 mM Tris-HCl, pH 8.8, 0.1% Tween-20, and 15 mM MgCl2, BIORON, Germany), 0.25 μl Taq DNA polymerase (BIORON, Germany), 0.5 μl MgCl2 100 mM (BIORON, Germany), 0.7 μl dNTP 4 × 10 mM (Pars tous, Iran), primer (variable), genomic DNA (variable), and ddH2O (variable). We also used prepared master mix (ampliqon Denmark Taq DNA polymerase 2X master mix red) in the total volume of 20 μl. PCR was performed with a palm cycler thermocycler (Genetix Biotech Asia (P) Ltd., India). The operation performed in four thermal cycler programs is shown in [Table 2]. 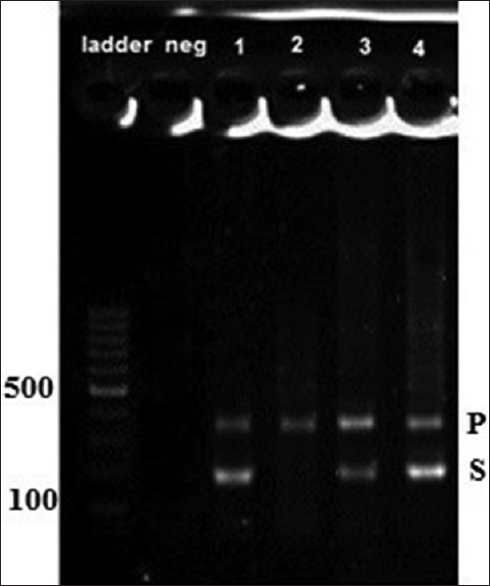 The PCR product resolved by electrophoresis 1.5% agarose gel (0.5X TBE for 45 min) while the gel was stained with Green Viewer before getting cold and visualized and photographed by Gel documentation (UVItec, UK) [Figure 1]. Statistically significant difference in the frequency of HLA alleles between HSP patients and healthy controls was determined by the Chi-square test. The statistically significant difference between allele frequencies for the studied polymorphisms and clinical signs was examined by Fisher's exact test using IBM SPSS Statistics for Windows, Version 22.0. Armonk, NY: IBM Corp; Released 2013. P < 0.05 was considerate statistically significant, and also odds ratios (ORs) with 95% confidence intervals (CIs) were calculated. Thirty pediatric patients (20 boys and 10 girls) with a mean age of 6.4 (SD = 3.06) and 35 adult controls throughout Iran were involved in investigation. The ratio of boys to girls was 2:1. All patients suffered from palpable purpura and amount of joint involvement, abdominal pain, and kidney involvement was 82.75%, 72.41%, and 10.34%, respectively. Other features such as urogenital, neurological, cardiopulmonary, and high blood pressure were seen in varying ranges of 3.44 in one case to 20.68 in six cases. A clinical scoring system consisted of the sum of three distinct scores for joint, gastrointestinal (GI), and renal involvements was used to assess disease severity. The severity of the disease was determined as low score and high score, if the clinical score was <4 and ≥4, respectively. The clinical features are shown in [Table 1]. Seven alleles of HLA-DRB1 were studied among Iranian children patients. Among them, HLA-DRB1*01 and HLA-DRB1*11 were higher in patients than controls, 90% and 83% versus 54.2% and 60.0%, respectively (P = 0.002, OR = 7.579, CI = 1.934–29.697 and P = 0.039, OR = 3.333, CI = 1.030–10.788). Other allelic groups showed no significant difference between two groups. In the present study, HLA-DRB1*09 was the most common allele found in both case and control groups. The result is shown in [Table 3]. There was no significant difference observed between HLA-DRB1*01 and HLA-DRB1*11 alleles in patients and the severity of the disease, P = 0.429 and P = 0.783 respectively. Our study was the first investigation on polymorphisms of HLA-DRB1 alleles in Iranian children with HSP. The results of positively susceptible alleles were consistent with previous studies. Like Italy population, we found a significant correlation between HLA-DRB1*01 and HLA-DRB1*11 with HSP. HLA-DRB1*11 is reported to have a significant association with HSP except in Northwest Spain and Spanish Caucasian. In our investigation, like what has been reported in India, and unlike other studies, we did not found any protected alleles. Before concluding, we would like to mention some limitations of the present study. There is no doubt that small sample size of patients can be the major one. For more accurate result, the size of both groups should be extended in next studies among Iranian pediatrics. In addition, we did not identify suballeles which is highly recommended for future studies. In the first study of correlation between HLA-DRB1 in Iranian children patient with HSP, we found out that HLA-DRB1*01 and HLA-DRB1*11 increase susceptibility to HSP, although no significant association of correlated alleles and disease severity was seen. The authors highly appreciate the clinics of Digestion and Rheumatology of Mofid Children's Hospital for their assistance for providing samples and blood donors and their parents for participating in this study. This study was financially supported by a grant from Shahid Beheshti University, vice-presidency for research and technology. Jauhola O. Henoch-Schönlein Purpura in Children. Finland, Oulu: University of Oulu; 2012. Lorber M. Henoch-Shoenlein purpura. In: Shoenfeld Y, Cervera R, Gershwin ME, editors. Diagnostic Criteria in Autoimmune Diseases. Totowa, NJ: Humana Press; 2008. p. 133-6. Ronkainen J. Henoch-Schönlein Purpura in Children: Long-Term Outcome and Treatment. Oulu: University of Oulu; 2005. He X, Yu C, Zhao P, Ding Y, Liang X, Zhao Y, et al. The genetics of Henoch-Schönlein purpura: A systematic review and meta-analysis. Rheumatol Int 2013;33:1387-95. Schmitt R. Studies of the Pathogenesis of IgA Nephropathy and Henoch-Schönlein Purpura, with Special Reference to Streptococcus pyogenes Infections and Complement Sweden. Lund University; 2012. Reamy BV, Williams PM, Lindsay TJ. Henoch-Schönlein purpura. Am Fam Physician 2009;80:697-704. Tizard EJ, Hamilton-Ayres MJ. Henoch Schonlein purpura. Arch Dis Child Educ Pract Ed 2008;93:1-8. Soylemezoglu O, Peru H, Gonen S, Cetinyurek A, Ozkaya O, Bakkaloǧlu S, et al. CTLA-4 +49 A/G genotype and HLA-DRB1 polymorphisms in Turkish patients with Henoch-Schönlein purpura. Pediatr Nephrol 2008;23:1239-44. Eleftheriou D, Brogan PA. The molecular biology and treatment of systemic vasculitis in children. In: Homeister WJ, Willis SM, editors. Molecular and Translational Vascular Medicine. Totowa, NJ: Humana Press; 2012. p. 35-70. He X, Lu H, Kang S, Luan J, Liu Z, Yin W, et al. MEFV E148Q polymorphism is associated with Henoch-Schönlein purpura in Chinese children. Pediatr Nephrol 2010;25:2077-82. Kiliś-Pstrusińska K. Paediatric Henoch-Schönlein purpura – Immunological and clinical aspects for a family doctor. Int Rev Allergol Clin Immunol 2012;18:41-5. HLA-DRB1 Major Histocompatibility Complex, Class II, DR Beta 1 [Homo sapiens (human)]; Gene ID: 3123;2018. Available from: https://www.ncbi.nlm.nih.gov/gene?Db=gene&Cmd=DetailsSearch&Term=3123. [Last accessed on 2018 Mar 18]. Ishii K, Takakuwa K, Mitsui T, Tanaka K. Studies on the human leukocyte antigen-DR in patients with endometriosis: Genotyping of HLA-DRB1 alleles. Hum Reprod 2002;17:560-3. Soylemezoglu O, Peru H, Gonen S, Cetinyurek A, Buyan N. HLA-DRB1 alleles and Henoch-Schönlein purpura: Susceptibility and severity of disease. J Rheumatol 2008;35:1165-8. Amoli MM, Thomson W, Hajeer AH, Calviño MC, Garcia-Porrua C, Ollier WE, et al. HLA-DRB1*01 association with Henoch-Schönlein purpura in patients from Northwest Spain. J Rheumatol 2001;28:1266-70. Amoroso A, Berrino M, Canale L, Coppo R, Cornaglia M, Guarrera S, et al. Immunogenetics of Henoch-Schoenlein disease. Eur J Immunogenet 1997;24:323-33. Aggarwal R, Gupta A, Naru J, Nanda N, Salaria M, Suri D, et al. Genetic susceptibility of Henoch-Schönlein purpura in children. Mol Cytogenet 2014;7:1. López-Mejías R, Genre F, Pérez BS, Castañeda S, Ortego-Centeno N, Llorca J, et al. HLA-DRB1 association with Henoch-Schonlein purpura. Arthritis Rheumatol 2014;67: 823-7. Ozen S, Pistorio A, Iusan SM, Bakkaloglu A, Herlin T, Brik R, et al. EULAR/PRINTO/PRES criteria for Henoch-Schönlein purpura, childhood polyarteritis nodosa, childhood wegener granulomatosis and childhood takayasu arteritis: Ankara 2008. Part II: Final classification criteria. Ann Rheum Dis 2010;69:798-806. Olerup O, Zetterquist H. HLA-DR typing by PCR amplification with sequence-specific primers (PCR-SSP) in 2 hours: An alternative to serological DR typing in clinical practice including donor-recipient matching in cadaveric transplantation. Tissue Antigens 1992;39:225-35. He X, Zhao P, Kang S, Ding Y, Luan J, Liu Z, et al. C1GALT1 polymorphisms are associated with Henoch-Schönlein purpura nephritis. Pediatr Nephrol 2012;27:1505-9. Saulsbury FT. Henoch-Schönlein purpura. Curr Opin Rheumatol 2010;22:598-602. Morris DL, Taylor KE, Fernando MM, Nititham J, Alarcón-Riquelme ME, Barcellos LF, et al. Unraveling multiple MHC gene associations with systemic lupus erythematosus: Model choice indicates a role for HLA alleles and non-HLA genes in Europeans. Am J Hum Genet 2012;91:778-93. Azizah MR, Ainol SS, Kong NC, Normaznah Y, Rahim MN. HLA antigens in Malay patients with systemic lupus erythematosus: Association with clinical and autoantibody expression. Korean J Intern Med 2001;16:123-31. Rezaieyazdi Z, Tavakkol-Afshari J, Esmaili E, Orouji E, Pezeshkpour F, Khodadoost M, et al. Association of HLA-DQB1 allelic sequence variation with susceptibility to systemic lupus erythematosus. Iran J Allergy Asthma Immunol 2008;7:91-5. Ali SM, Mahnaz S, Mahmood T. Rapid genomic DNA extraction (RGDE). Forensic Sci Int 2008;1:63-5. Runstadler JA, Säilä H, Savolainen A, Leirisalo-Repo M, Aho K, Tuomilehto-Wolf E, et al. Analysis of MHC region genetics in finnish patients with juvenile idiopathic arthritis: Evidence for different locus-specific effects in polyarticular vs. pauciarticular subsets and a shared DRB1 epitope. Genes Immun 2003;4:326-35. Kurata R, Yonezawa T, Inoko H. Association analysis of the polymorphism of human leukocyte antigen-A, -B and -E gene with Behcet's disease in Japanese cohort using sequencing-based typing method. MOJ Immunol 2014;1:00013. Chen QY, Huang W, She JX, Baxter F, Volpe R, Maclaren NK, et al. HLA-DRB1*08, DRB1*03/DRB3*0101, and DRB3*0202 are susceptibility genes for Graves' disease in North American Caucasians, whereas DRB1*07 is protective. J Clin Endocrinol Metab 1999;84:3182-6. Farivar S, Dehghan Tezerjani M, Shiari R. Association of HLA-DRB1 alleles in juvenile-onset Systemic Lupus Erythematosus (SLE) in Iranian children. Int J Pediatr 2015;3:555-60.